The spiritual successor to the Dodge Neon is back with the new Dodge Caliber. This four door family car is distinguishable from its competition by a signature Dodge single cross hair grille. The rear body spoiler gives the car a sharp silhouette and retains the color of the body which is available in such colors as bright white and red pearl. For more options on the exterior look of your new Dodge Caliber, there’s the Mopar hood cover which provides the extreme protection of a sturdy black vinyl to guard against road debris. If you want to make the Caliber shine even more out on the streets, then the replacement chrome fuel filler door will give you the added beauty to stand out. 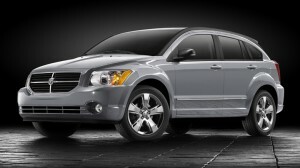 The Dodge Caliber is a fantastic car for someone looking for something roomy yet inexpensive. The hatchback design of the car gives that offer with its versatility. Perfect for the family on the go, with a spacious cargo area, you’ll find plenty of room for storing all kinds of things for any camping excursion to the Hudson Valley. On top of that, you’ll the Caliber perfect for any trip, with an available rooftop cargo box carrier if the back just isn’t big enough. There’s also the hitch mounted bike carrier that holds two bikes and still manages to fold down making it so you can get the lift-gate open without being forced to remove it. It’s a great offer, what with the 250 pound capacity cargo floor storage that has the removable washable liner, for anyone looking to escape the city life for that weekend getaway without leaving anything or anyone behind. That ride our to the country is going to be a comfy affair all thanks to the interior design that looks to give the smooth ride possible. The seats are available in premium cloth or a leather trim that’s sophisticated and attractive. With the details stitching that’s used, it’s finely crafted and gives the Caliber an air of unmatched refinement. To add to the comfort level of the car, you’ll also be able to enjoy such things as automatic climate control which will keep the temperature control to a precise setting that you set. There’s also options for heated mirrors to help defrost the side mirrors during those cold winter mornings and heated seats to make sure you’re not too uncomfortable during any winter trips. The Dodge Caliber has two different offerings for the engine. The 2.4 liter World Engine has an impressive 172 horsepower with a 165 pound torque. It also offers 29 miles per gallon once you get on the highway and a 5 speed manual transaxle transmission. The other engine being offered is the 2.0 Liter DOHC 16 valve dual VVT engine. It has horsepower of 158 with a 141 pound torque. This one will get you 32 mpg on the highway. With that 13.6 gallon tank, you’ll have plenty of road between you and the next gas station. The Caliber also comes standard with transaxles CVT2’s autostick which substitutes belts and pulleys instead of gears in the fight to give you a smooth and more efficient riding experience. The best way to deal with an accident is just to avoid one. That’s what the Dodge Caliber tries to do with it’s electronic stability control. This lets you keep control during any extreme steering maneuvers. It senses when your car is starting to get out of control and attempts to correct this by controlling the throttle and applying brakes on individual wheels. Combines with anti lock brakes and a traction control system, the Caliber wants to keep you out of trouble. Should the worst happen, the Caliber has you covered. To make sure you protected, the Caliber has standard multistage airbags for both driver and the front passenger. To compliment this and for the rear passengers, there are supplemental side curtain airbags and even available side seat airbags. To ensure that the car can hold up, it is designed with strengthen materials at engineered crush zones. It goes to show that Dodge Caliber cares about getting your family an affordable car without having to worry about their safety. This entry was posted in Bayside Queens, Dodge Caliber, New Car and tagged Bayside Queens, Dodge, Dodge Caliber, Dodge Neon, Hudson Valley, MOPAR, New Car, Used Car by baysideadmin. Bookmark the permalink.